Do you know how to throw a knife or you are just learning to-do-so? 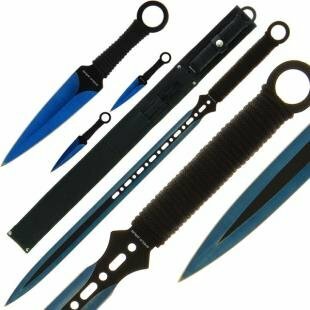 In this review, we will guide you on how to choose the best throwing knives for your various activities like hunting, for leisure, sport or for security purposes. Throwing a knife is an art and requires some basics to be followed for a successful and firm trajectory. The sharpness of the knife should not be highly considered when looking for a throwing knife. Instead, one should consider a knife with a good length (especially for beginners), weight, design, balance and metal quality. 2.6 Best balanced throwing knife! As you embark on searching for the best throwing knife in the market, you will come across different sizes, shapes and designs. For you to land on the best, you’ve to know what to look for. Quality throwing knives last longer and will stick to your target. They are well balanced and have a sharp edge. Such knives are durable and will give you a great feel when using them for your various practices. Metal quality: a good metal for the blade will provide a longer life to the knife as it can hit hard surfaces like cement or rocks and still be without any bends. Low quality knives bend or even break easily and cannot penetrate hard surfaces. The two metals commonly used in knife making are stainless steel and carbon steel, with stainless steel regarded as the best. Weight and length: These are two important features to view when acquiring a throwing knife. The knife should be a bit heavy so that it can be firm when thrown. In addition, the knife should be longer for beginners as shorter knives require great skills to hit the target. Long knives spin slower while shorter knives spin faster. Blade: when choosing a throwing knife, ensure that it has a sharp tip with blunt edges. The edges of the blade are deliberately made blunt to maintain the momentum when the knife is being released in the direction of its aim. As well, it is made sharp at the tip so that it can easily stick into the bark of its target. Ergonomics: A nice throwing knife should’ve a good design. This guarantees that when you throw the knife it is able to maintain its path without losing the flight on its way to the target. The design of the knife includes everything from the blade, handle, length and weight. Everything needs to be in line for the knife to be very accurate. Handle: This is another great factor to consider in a knife. The design of the handle influences its speed and flight. As you pick your knife, ensure it has a nice grip for better handling. The best material for a knife handle is wood. It offers a steady grip. Other types of handle material includes; rubber, plastic and brass guards. Rubber handles tend to stick when throwing a knife and are a bit heavy. These should be avoided at all costs. Balance: A balanced knife is very efficient in use than an unbalanced knife. For you to determine a balanced knife, hold its center of gravity (COG) and see whether it balances on your hand. Unbalanced knife usually has a heavy handle and is hard to maintain a steady flight when released to its target. After looking at the key features to identify in a good throwing knife, here are our top picks throwing knives from different manufacturers. These knives are sturdy, durable and well balanced to ensure you don’t miss your target. The SOG knives are great for target practice and all purpose throwing. The knives come with a paracord wrapped handles that provides a nice grip for handling the knife as you throw it. The knives which come in a set of three have a hard-cased black coating and are highly scratch resistant. The nylon sheath holds all the three knives and offers safety. The knives are very durable as they are made from 420 stainless steel and is accompanied with a limited lifetime warranty. They are very sharp and stick in the target. Have a great paracord handle. The sheath is a bit weak. 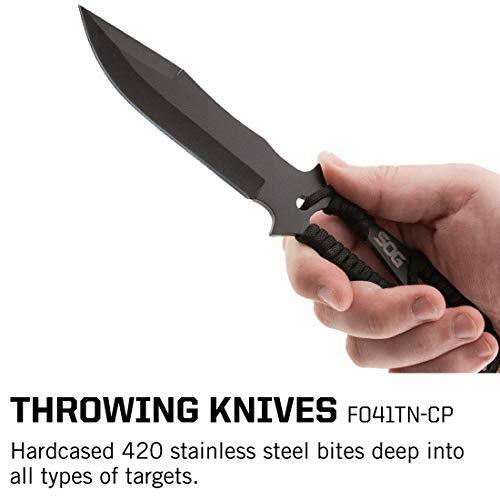 Perfect point RC throwing knife is made with black stainless steel and is a very quality knife. It has a wonderful design and comes decorated with spider. 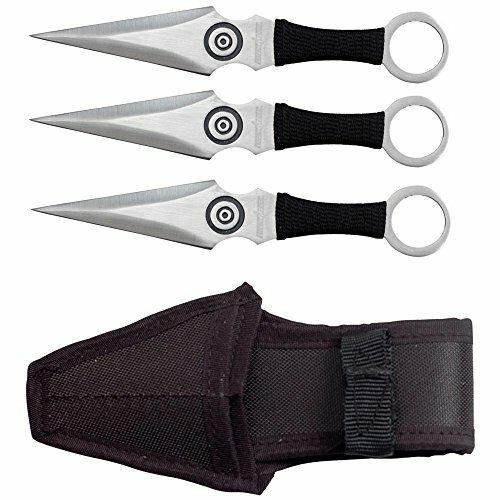 The balanced throwing knife is available in a set of three with every knife measuring 8 inches. With the laser cut out at the end of the handle, you can tie a ribbon on the knife. These balanced knives come with a black nylon sheath for easy and safe carrying wherever you go. They are well balanced for a good throw. The coating wears off with time. 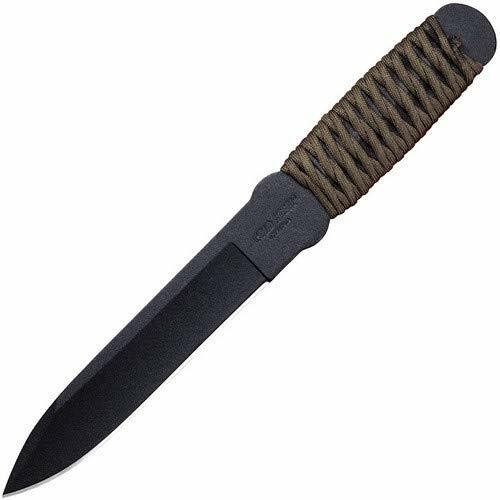 Similar to perfect point RC, the perfect point PP set of knives come in 3 and are kept in a black nylon sheath for easy transport. The three silver stainless steel knives are engraved with a bulls-eye decoration and look sturdy. Every knife measures 6-1/2 inches and are well balanced for a perfect throw. A special feature of these knives is the cord wrapped handles which gives the user an outstanding grip. Has a nice grip made of cord wrapped handles. The cord is of a low quality. The knives are not well balanced. If you’re looking for a perfect throwing knife, the Cold steel knife is the ideal knife to use. The knife is very durable as it’s made from a quality 1055 carbon steel material. The blade has a thickness of 5mm and can penetrate several surfaces. It comes with a Cor-Ex sheath for easy and safe carry. The knife has a total length of 12 inches with the handle measuring 5-1/4 inches long. The handle has a paracord wrap which provides a nice grip. The knife is greatly balanced and very easy to control. It is highly durable and strong. Does not corrode or rust as it has a protective coating. The edge is sharp and not ideal for a throwing knife. 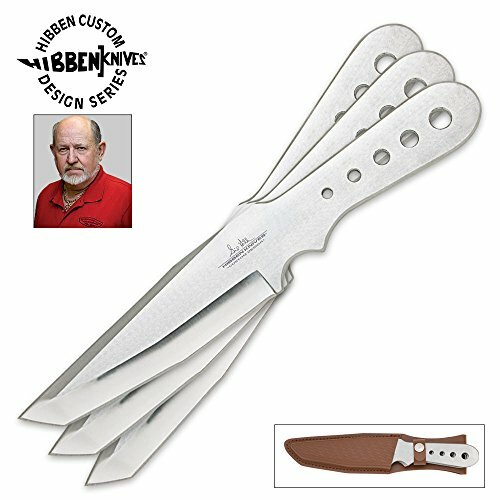 When it comes to the best throwing knives in the market, Gil Hibben is a name you’re likely to come across. This is a knife suitable for expert knife throwers. It is well balanced guaranteeing even rotation when thrown accurately. This knife comes in a set of three and is made from 420-J2 stainless steel. This is a very durable material. As well, it has a non-slip high tensile cord-wrapped grip for better handling and accurate throw. Generally, the knife measures 8-5/8 inches with the blade measuring 4-1/4 inches. 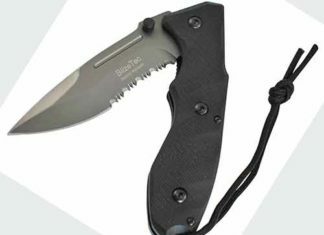 As well, it comes with a black nylon sheath for storage and easy carry as you go hunting. They spin uniformly in the air. The knife is very durable. Has a great weight for throwing. Has a low quality paracord around the handle that peels off easily. Throwing knives have become popular with increased diversity in use. Although, throwing knife use for target practice but sometimes, your throwing knife may prove so important in case you are ambushed by a thief or burglar and have no time to pull out your gun. So, when picking a throwing knife, ensure it has the right weight & length, balance, design and should have a sharp edge to stick in your target. Choosing the best throwing knife is not an easy thing. Many brands are coming up with new throwing knives and you can’t test all of them. It may be because you don’t have the money to test all of them or the time. Worry not! In this review, we’ve conducted a thorough research and simplified things for you. We selected the best throwing knives after testing several of them and reading lots of reviews. Throwing knives is a pickup sport that has continued to develop. In order for you to master how to throw the knife accurately, you need to select a knife that is comfortable with. A good throwing knife should be durable, balanced, have a standard length, and have a pointed tip that will easily stick in the target. Read on to find out the best throwing knife for your sport, hunting needs or for self-defense. Question: What should I look for in a quality throwing knife? Answer: If you are new to throwing knives, there are some few things that you should look for before rushing to get one. These are the sharpness of the knives. They need to be dull and not sharp. They should have a handle with a firm grip for easy throwing. The throwing knife that you choose should be simple and round in shape. Also, it should be of a high-quality, lightweight, and sturdy. Stainless steel is the best material but for durability, go for carbon steel. They should also be well-balanced, of a standard length, rust-resistant, and scratch resistant. Question: What can I use the throwing knife for? Answer: The common use of the throwing knife is for throwing for fun or as a sport. Today, people compete to throw knives and even there is a record for it. Besides being a sport, a throwing knife can as well be utilized for hunting and as a self-defense weapon. When it comes to using a throwing knife as a defensive weapon, you have to master how to throw it very well so that you don’t miss the target. You don’t want the knife getting in the wrong hands and be used against you. Question: Do Knives always turn? Can I throw it straight? Answer: Throwing knives do always turn during the flight, with the handle and blade spinning in the air while pointing to the target. This is because the circular movement from the throwing motion is shifted to the knife. But if you want to learn how to throw a knife straight, there is a technique that you can learn and be able to do so. 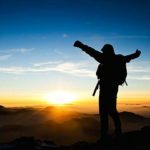 This will take you a very long time to learn but you will have to be patient in order to grasp the technique. Question: How sharp should my throwing knife be? Answer: Unlike normal knives which have to be sharp because they will be used for cutting, throwing knives don’t have to be sharp at all. Actually, sharp blades my just cut your hand while spinning or throwing the knife. All you need is a perfect pointed tip that can stick in the wood or the item you throw it at. Additionally, blunt knives are much less prone to ugly dents. I hope you have gotten your answer after reading this best throwing knives. You can comment below for more information.